The legacy left by James Owens, Auburn’s first black football player seen here in 1972, is still felt at Auburn today not only in the through the newly-established James Owens Courage Award, but in the presence of his nephew LaDarius Owens, who wrote this story. Those who know James Owens and his story understand how much his name means to Auburn University. 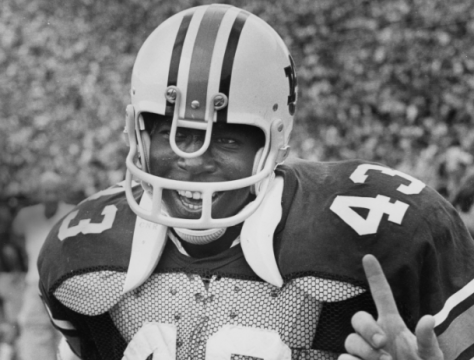 Owens was the first African-American football player on scholarship at Auburn. He arrived on Auburn’s campus as a freshman in 1969. Being Auburn’s first African-American football player—and one of only a handful of African Americans enrolled at Auburn—just a few years removed from the heat of the civil rights movement wasn’t easy. But having grown up right outside Birmingham in Fairfield, Ala., Owens was no stranger to racial adversity and attention. When Owens tried out for the Fairfield High School football team, the coaches told him that he was too late. To Owens, the message was clear—he was too late and too black. “I was upset, but I said, OK, I will just play basketball and run track,” Owens says. He tore up the track and basketball court. By the time football tryouts rolled around again, his athleticism was obvious. He didn’t have to try out. The same coaches who turned Owens away the year before were now at his door asking him to play. Owens later told them yes. As expected, he dominated Friday nights with his great size and speed. And as expected, he caught the eye of college recruiters from across the country. The only problem with Owens’ plan to attend Grambling was that it wasn’t close to home. But finally a school that was close to home along and offered him a football scholarship: Auburn. Owens was close to home, but also close to prejudice. Does Owens regret his choice of coming to Auburn or being the first to do so? Owens says he is also proud to have helped pave the way for players like Bo Jackson, Karlos Dansby, and Cam Newton. Owens is still remembered and respected at Auburn. The university recently established an award named in his honor to be given to a student athlete who has displayed courage in the face of adversity. The first recipient of the James Owens Courage Award was none other than James Owens himself. Related: Picture Day — James Owens. Well done! We were at the game where James Owens was honored. It brought tears to my eyes. What a great article. I was a small kid in the stands cheering on big #43, with no idea of the racial turmoil of the day. Thank God we have come a long way. A man of courage. Thank goodness for his strength. Well written article! It brought tears to my eyes.